This corner of the website has sat unattended for 11 months, due mainly to the fact that things have been quite busy around this little slice of rural Tennessee paradise. 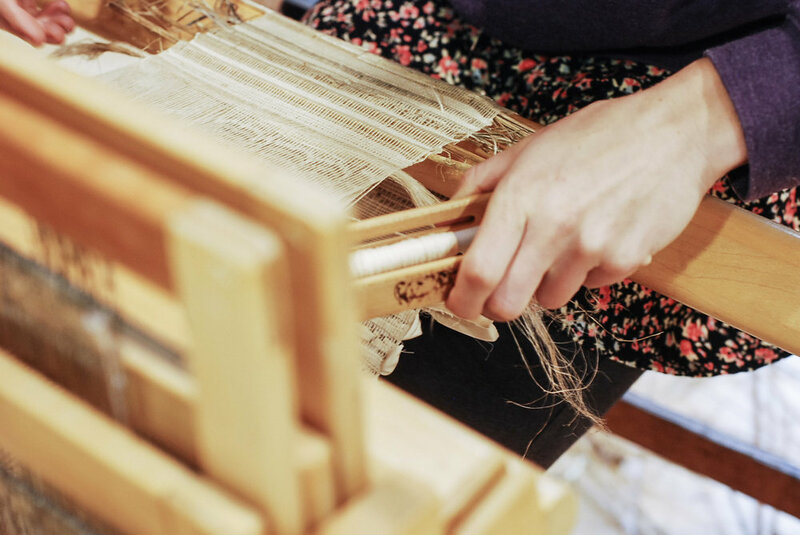 2017 has been filled with opportunities to collaborate on various textile workshops + events offered here at the farm and throughout the Southeast. Perhaps it's time for an update. Started off the year by hosting my favorite textile recycling wizards Emily + Michael Felix of Reunion Yarn Co. to teach the basics of how to choose and unravel sweaters into usable yarn. The workshop photos were somehow lost when transferring from the camera to the computer, so here's a link to last summer's Sweater Unraveling 101 session I documented in a previous blog post. Side note: Emily was a rockstar and instructed this class while she was 8 months pregnant. In addition to raising an adorable little poop machine, Emily has been building an online version of this workshop via an online community, the Unraveling Club , that is available on a subscription basis. The step by step instructions cover everything from sourcing, de-seaming, unraveling, washing, and finishing, enabling you to turn thrift store sweaters into miles of reusable yarn for super cheap if you're willing to put in a little effort. Elise of Greenroom Weavings came up the following Saturday to lead participants through the basics of weaving while enjoying an open fire in the front room of the farmhouse. 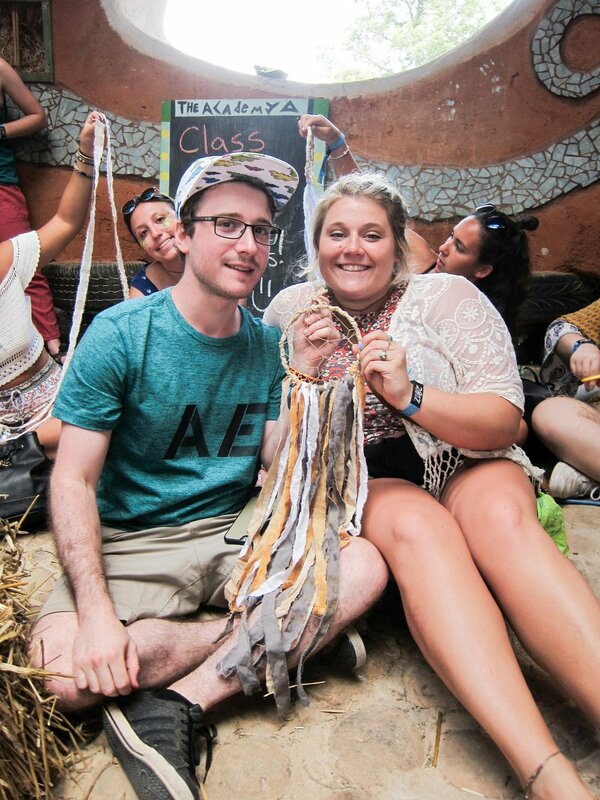 I love hosting Elise at the farm because she inspires me to learn new techniques and I am constantly inspired by her unique weaving style. 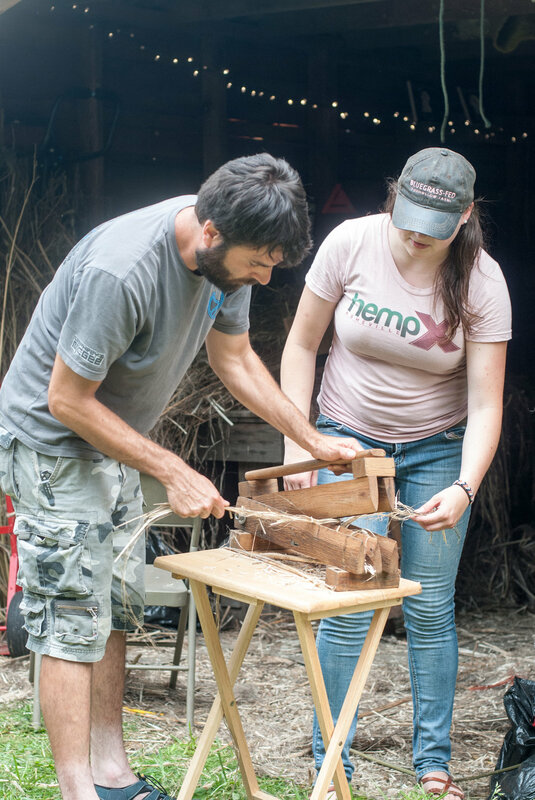 A fabulous weekend spent in Kentucky, immersed in hemp textile education + processing, thanks to the collaborative efforts of Fibershed and Mike Lewis. Friday night started off with dinner + presentations at Berea College, which happens to have quite a rich history of weaving and textiles. 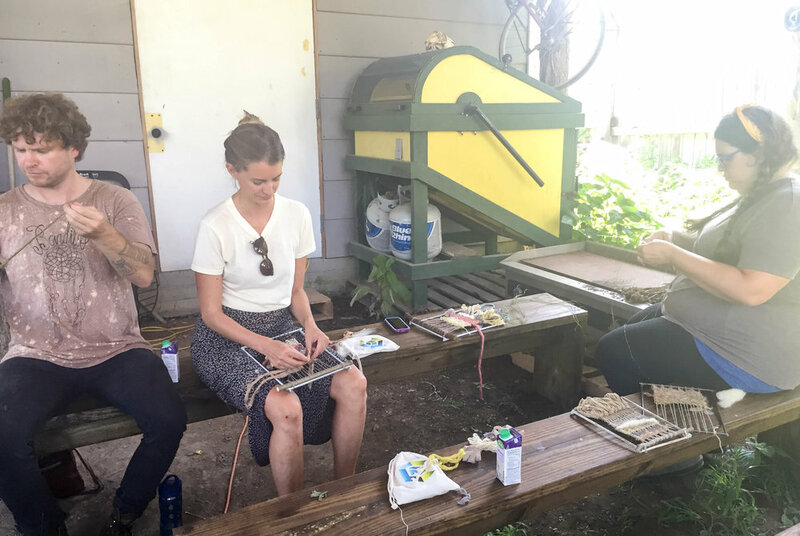 On Saturday, we migrated to Livingston, where we taught various processing steps required to turn hemp into usable fiber. 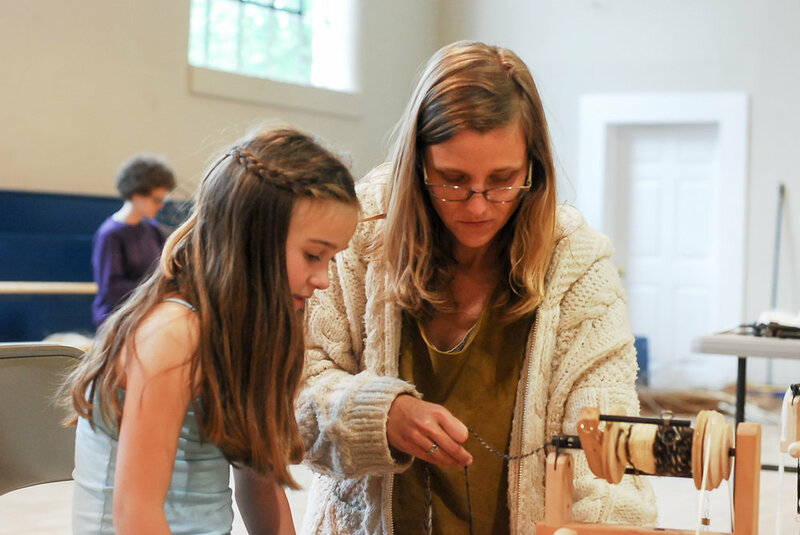 I had the honor of teaching alongside the talented weaver, Leslie Terzian, who I have been admiring since she worked on the Grow Your Jeans project a couple years ago. 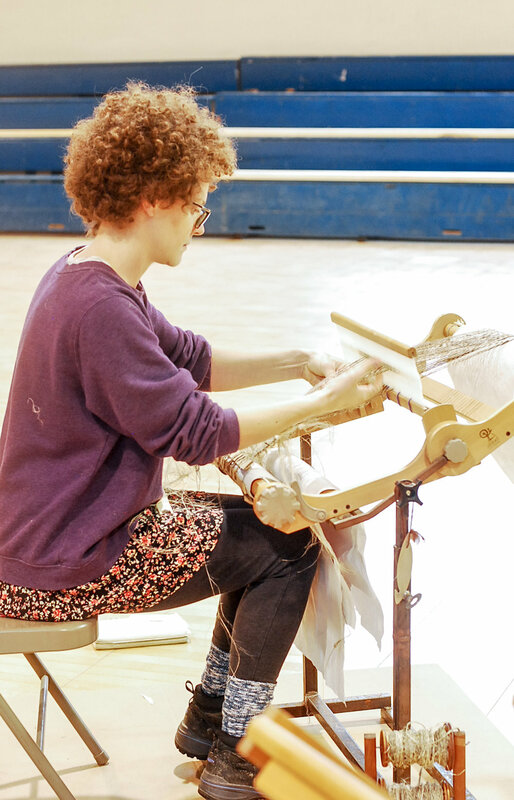 We set up looms, brakes, hackles, and spinning wheels in the gymnasium of the local school and allowed attendees to float from station to station at their leisure. 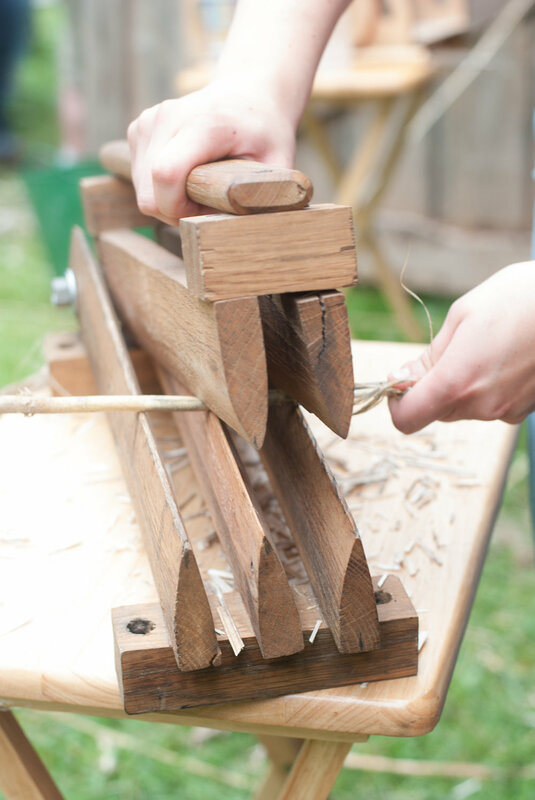 Trekked back up to beautiful Kentucky to teach spinning / weaving at Mike + Melinda's farm during their annual Hemp in the Holler event. Nestled in the hills beside a field of hemp sprouts, we set up camp for the weekend surrounded by good people and great food. 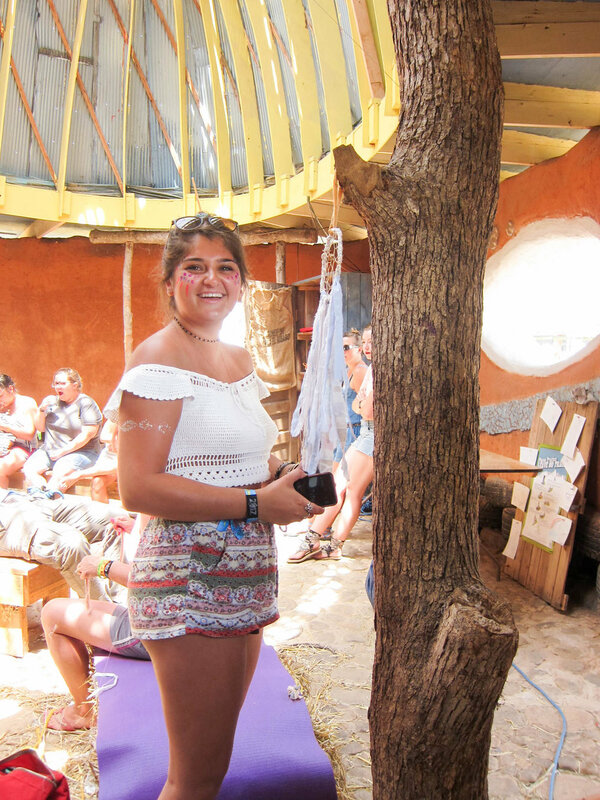 My only wish was to have spent more time with Elishewa of Artisan Hemp, who was simultaneously teaching her unique process of paper-making utilizing the plant fiber. If you are interested in learning more about Elishewa's work, this video is a great place to start. The lovely folks Simone and Robert over at the Southeast Tennessee RC&D have been an incredible source of awesome things the past couple years. They helped me out with a grant to cover the cost of fencing and irrigation at the farm last summer, which was a perfectly timed blessing. This year they decided to graciously pass my name along to the folks who are in charge of organizing Planet Roo and the Sustainable Workshops at Bonnaroo. 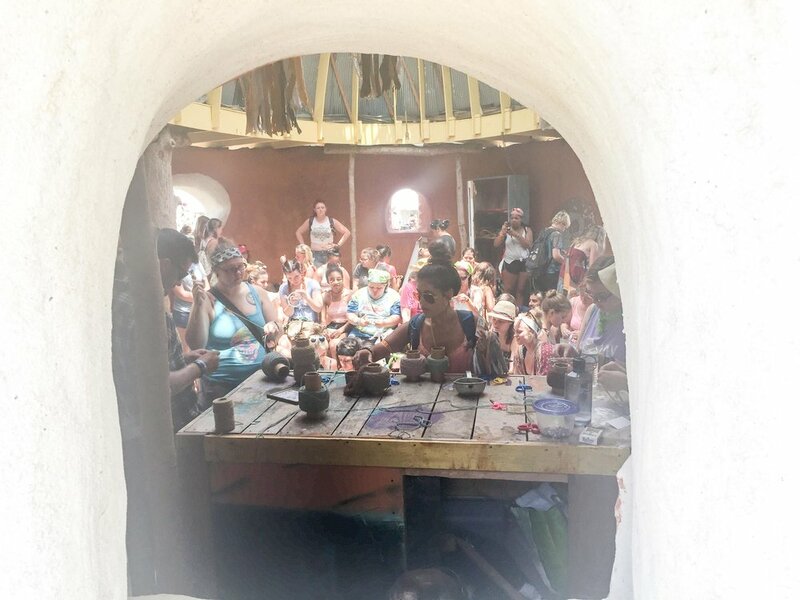 Thanks to Simone and Robert, we had the opportunity to teach two workshops at a large music festival that just happens to be less than an hour from the farm. 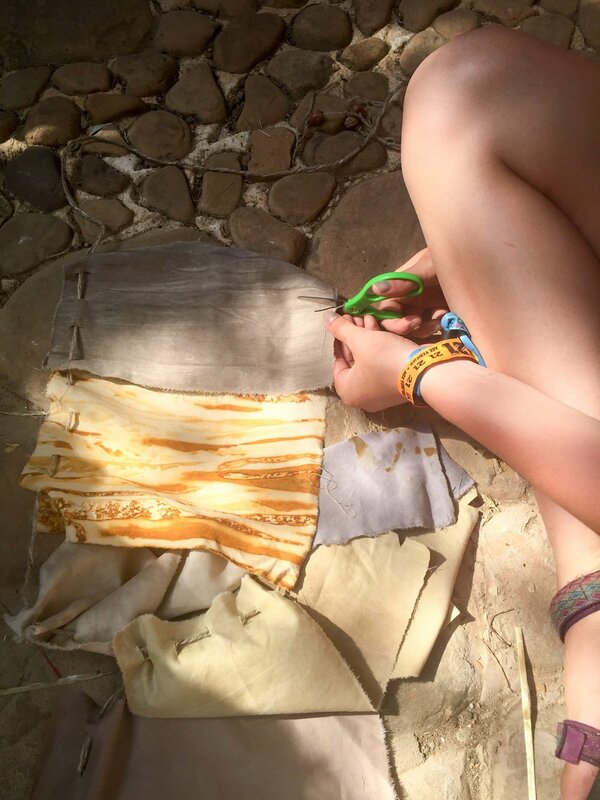 Working alongside my textile soul sister Brenna over at Radiant Shade, we led folks in creating over 100 dream catchers and prayer flags from kits I previously assembled using recycled + naturally dyed fabric from the scrap bin. Afterwards we took advantage of the live music surrounding us for a few hours before moseying back to the farm at the end of the night. An afternoon gathering of folks interested in learning a bit more about growing hemp for fiber in Tennessee, graciously hosted by Will + Christie Tarleton of Six Boots Farm . Will led a well-rounded discussion covering the planting + growing techniques, harvesting, end use, and current legislation. 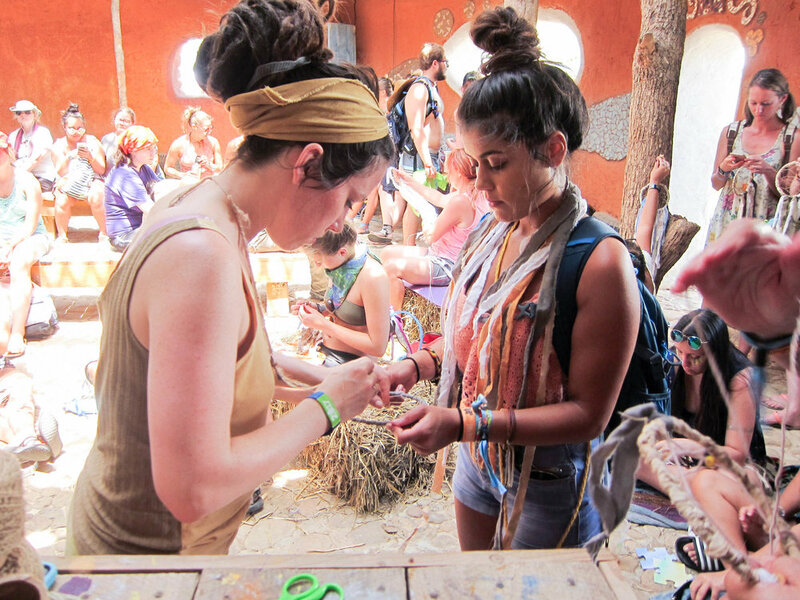 Afterward we set up brakes and hackles for folks to experience hands-on processing of freshly harvested hemp that had been grown right down the road. I brought spinning + weaving supplies and natural dye samples to provide idea of what this plant could look like in textile form. Paige brought hemp dogs and basically organized the troops to make this event a success, per usual. A laid-back day with two amazing ladies teaching the basics of weaving and basically agreeing to form some sort of skill share in the foreseeable future. The best part of workshops is the opportunity to meet incredible people that you wouldn't normally get to meet in the day to day journey. A new twist on Weaving 101. I met this fabulous group at the Foster Falls pavilion where we warped our looms and began the trek to the overlook. Using the view of the waterfall as a backdrop, I set out the prepped fiber bundles and let folks choose their naturally dyed colorways. Once we reached the bottom of the canyon, we took a side trail that lead to this giant, moss covered boulder in the middle of Fiery Gizzard Creek. There I led instruction on several basic techniques, letting Mother Nature take the lead for aesthetic inspiration. At the end of the day a few of us took a dip in the pool at the bottom of the falls, and made the 7 mile caravan back to the farm for a quick tour and introduction to the animals. The weather could not have been more accommodating nor the company of the amazing ladies who participated in this unique experience. This event marks the beginning of a series of Weaving + Waterfall Hikes - stay tuned as the leaves start to change and more dates/locations are announced.